And it shall come to pass afterwards, that I will pour out my Spirit on all flesh! Joel 2:28 ….And his glory shall fill the whole earth. Finally I send you a few notes. The time has run so fast since I last wrote to you from Sudan. In January we had our move from Sudan via Kampala to Nairobi. We arrived safely with all of our luggage and favourite items of our household over the last few years in several countries (favourite plates, pictures, dolls, teddies, curtains and lots of memories.) 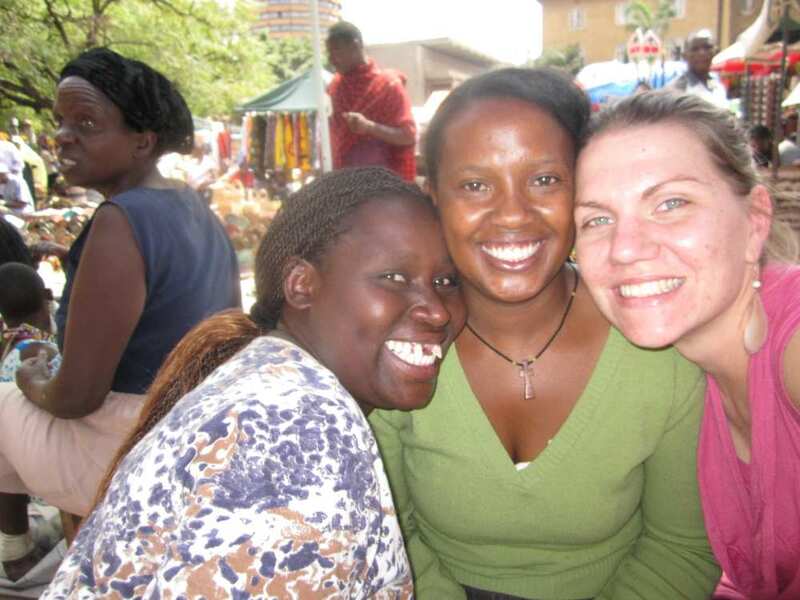 While in Kampala for a few days, the documentary of ´Mama Shekinah `was launched at Africamp 2011. It was a very precious moment. Pr John Mulinde had just preached an awesome message the Lord had laid on his heart.It was about finishing the race, he challenged us to not get distracted, too exited or too distressed by minor victories nor defeats, but finish the mission God has placed on our heart…..we were all so challenged. Than came the movie, and after that we all prayed for the ambushers, and for the nations, like Uganda and Sudan. Shekinah gave testimony of Jesus, who took her into his arms a few months ago and told her, that he is her Father and she is his princess. It was just all so beautiful. 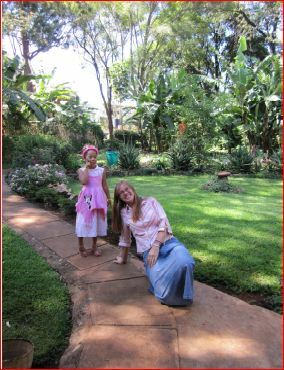 Finally mid January we arrived in Nairobi, we have been surrounded by the warmest welcome and family atmosphere we could imagine, here at the compound of the Mennonites. Our little house has been such a blessing, I cannot even count the joy of it all, the fun Shekinah has with the neighbours kids just a minute away,a very encouraging team, the rabbits, chicken and garden that makes this place feel like country side,(see picture) inmidst a 4-5 Million people city, the birds singing in the morning, the sun shining through my bright orange curtains, many spontaneous visits coming through the house, warm showers, electric power, water out of the tap, supermarkets, driving a car (belonging to the mission), finding great school for Shekinah who will start officially going to school in May, God smiling at us as he watches us enjoying our warm nest. Exactly a month ago Doris arrived from home in Paraguay, who is going to be with us for a few months. She brought Paraguayan Tea (Mate) and many lovely surprises from many lovely friends in Paraguay. And of curse she brought herself, which is the greatest gift. We have such good times together, and it seems I am getting younger all the time with so much youth around. What a blessing, thank you so much. While I am more of the home maker and writer now (working still hard on the book that shall be published soon, pls keep praying), Doris is the one going out and making lots of new contacts and experiences. She is so beloved at the Sports Centre in Eastl, coaching some Aerobics, while making friendships. 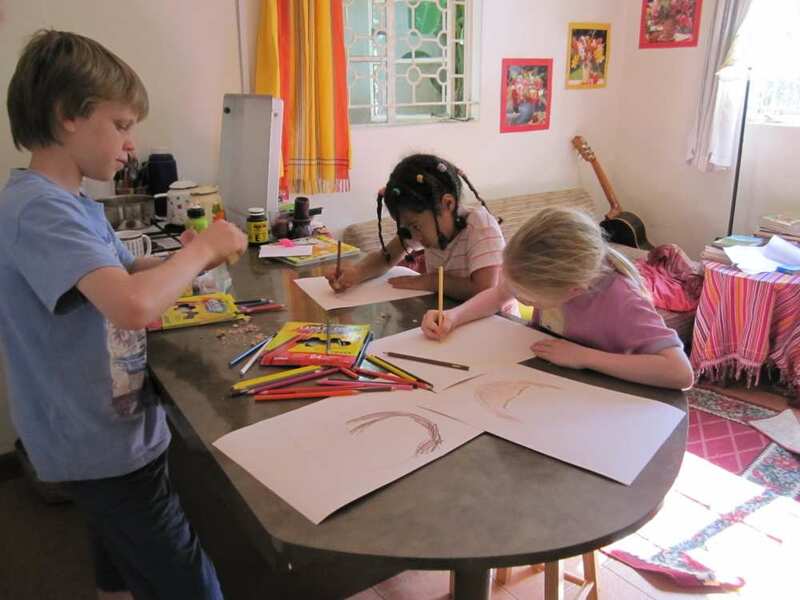 (See her with friends in the market place) She also helps us at home with home schooling and even Ballet classes……..who wants to be the next one to visit and become part of what God is doing? 2 weeks ago I was invited to share at a Missions conference and Graduation of a Missions training school in Kitale, 8 hours towards West of Kenya. It was so touching to see a missionary force rising up out of many different denominations and churches, even from the neighbouring countries. Even more touching it was, when we all kneeled down and dedicated our lives anew to God. 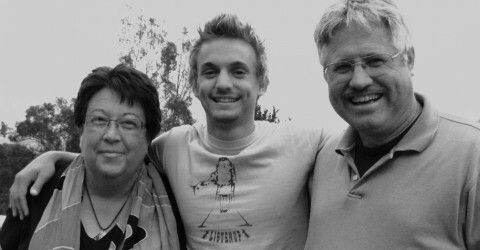 People were so encouraged after I had shared with them about the reception Colin received in Glory after his last breath on earth. The awareness that we can never loos out on God, that he never will leave us alone up to the last city and the end of the world, and that at the end he welcomes us home, becomes greater than the fears and pains of persecution. Last week I went with Shekinah and Doris to the North East of Kenya. Again we had a wonderful time sharing with Intercessors who the Lord is raising up to pray till his Kingdom also becomes the reality in the som world. Their dedication in praying every night is remarkable. Than on our way home we were stopped and taken back to the Police. After several offices and long interrogations we were allowed to go to our friends house upon the promises that we would return with our original passport (which we usually leave home to keep them safe, while travelling locally just with copies of the passport) Those hours were terrible and especially scary for Shekinah. While under ´house arrest´ we were able to continue sharing the Good News and encourage the believers. Finally on our way back home a few days later, we realized what the whole hassle was all about. After Kenya receiving some warnings that the fundamental islamic groups in Somalia would harm them if they help the fragile government of Somalia against terrorism, Kenya decided to seriously guard this particular road from any stranger, and we just happened to be in this som region at this particular time. During these days we again became more aware of how desperate the world situation is, but how, through this all, the people become seriously disillusioned of their ways and outworking of religion, and what great opportunity to share about the one who is not religion, but the answer, Jesus the Messiah. Thank the Lord with us that we didn’t have to stay in jail cells of bad conditions, but rather could be with friends, Thank the Lord for protection. Pls pray for the Islamic nations. The turmoil in many of their nations just shows their dissatisfaction, may the despair lead them by the hundreds and thousands to the Messiah. There are already awesome testimonies Pls also pray for our next trip to Sudan, from 10th of April to 1st of May. I have been invited to teach at a Centre of Peace and Reconciliation in Yei. We will also see our beloved friends and even visit Morobo and our land. Immediately after that, on the 3rd of May, is Shekinah´s birthday, she will turn 5 and will start schooling in Nairobi. Until here the Lord has led us, what a privilege to have been able to install everything into her as the Lord has led me. Now as the next step in her life starts, keep on praying, that the Lord will form her into all he has dreamed her to be. She is such a joy, and in spite all she has experienced in such a young life, her love to Jesus is growing. (see her and kids in our kitchen/living room) Thank you all for being part of the story God is writing in the nations and in us. I confess it is scary sometimes, I often desire to hide far away in a quiet corner of Paraguay, than again I feel so privileged to be part of HIS story, and say Yes, Lord, whatever your will, but Maranatha, Jesus come soon! We love you all.